Of course we need to think. If you and I weren’t thinking right now, I wouldn’t be writing this and you wouldn’t be comprehending what you’re reading. In addition, thinking about the past and the future is essential at times in order to make wise decisions about our lives. Even when meditating, we’re not to get discouraged when thoughts arise. We just note them without aversion or judgment. If we didn’t give the body a rest at night, it wouldn’t function very long. The only time the mind can have a real rest is when it stops thinking and only experiences. Once verbalization stops for a moment not only is there quiet but there is a feeling of contentment. That quiet, peaceful space is the mind’s home. It can go home and relax just as we do after a day’s work when we relax the body in an easy chair. Here are five suggestions for practicing Not-Thinking. Try them for a few minutes throughout the day—while sitting at your desk, while standing in line—almost anywhere will do. It does take practice though, because we’re surprisingly addicted to discursive thinking. 1. Open the five sense doors to whatever is happening around you. When you’re immersed in discursive thinking, it’s easy to forget that there are five experiences that are available outside your analytical mind: what you’re seeing, hearing, smelling, tasting, and feeling physically. Try letting your attention rest on what’s coming in at these five sense doors. You’ll find a rich and fascinating world right at your fingertips—with that last sense door, literally at your fingertips, perhaps in the feel of soft material against your body. Then immediately direct your attention to whatever is most prominent in your sensory experience. It could be the sight of an art print on a wall. It could be the murmur of a conversation nearby. It could be the smell and taste of an apple you’re eating. It could be the physical sensation of the breath coming in and going out of your body. Left unattended, the mind tends to dwell on thoughts about the past or the future. But if you consciously pay attention to what’s happening around you, you can take yourself out of discursive thinking mode. This can be relaxing and renewing on a deep level. No-thought is to see and to know all things with a mind free from attachment. When in use it pervades everywhere, yet it sticks nowhere. Hui Neng is not saying that you’ll always be able to empty your mind of thoughts. Rather, he’s suggesting that when a thought does arise—like “I don’t feel well”—you respond to it without attachment, which means just watching it until it passes out of the mind, just like the sound of a bird singing arises and then passes out of the mind. When thoughts “stick nowhere,” to use his words, you don’t go down that papancha road, spinning a thought out into every stressful scenario you can imagine. 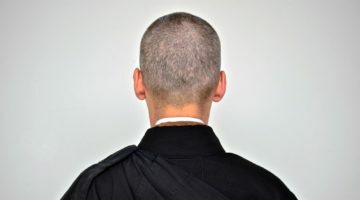 The Vietnamese monk and teacher Thich Nhat Hanh describes “not sticking” this way: “Thoughts and feelings come and go like clouds on a windy day.” I like to keep his phrase in mind when I practice Not-Thinking. 3. Let go of opinions and judgments. It’s easier to practice Not-Thinking if you put opinions and judgments aside. Doing this also brings welcome relief from constantly judging everything around you. Most of us tend to immediately form opinions about our environment (too hot, too cold) and about people (too talkative, too quiet). Listening to this running commentary is stressful and exhausting. 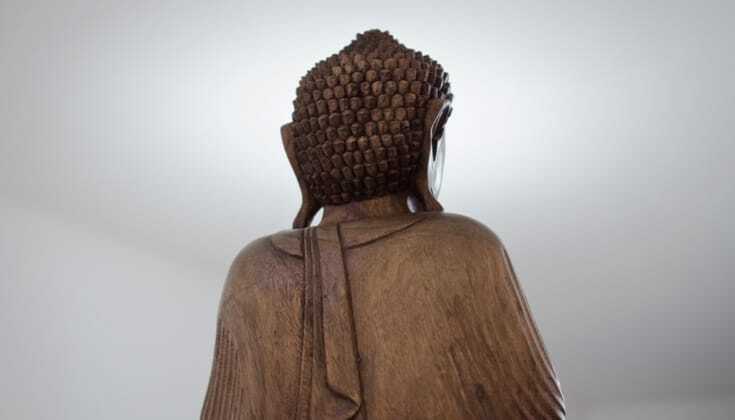 When the Thai Buddhist monk, Ajahn Chah, was asked what the greatest obstacle for students wishing to practice Buddhism was, he replied, “opinions.” When you’re able to let go of opinions and judgments, you’re letting go of a big “chunk” of what goes on in your mind! This is a great aid in the practice of Not-Thinking. 4. Open the hand of thought. Zen teacher Kosho Uchiyama wrote a book titled, Opening the Hand of Thought. I use this phrase to practice Not-Thinking. Sometimes I’ll even open my hand and lightly blow on my palm as if I’m dispersing thoughts into the air like they’re dandelion seeds. I imagine all my trivial concerns and opinions just blowing right out of my mind, leaving me free to experience the world without the burden of analyzing every moment of my experience. When I do this, I can feel my mind relax and, just like Ayya Khema said would happen, a feeling of contentment arises. 5. Let the world speak for itself. This is a practice I learned from the Tibetan Buddhist teacher Pema Chödrön. She practices “letting the world speak for itself” when she’s in places like airports where she has a wait ahead of her. Instead of picking up something to read or getting lost in thoughts about the past and the future, she simply sits and watches what’s going on around her. 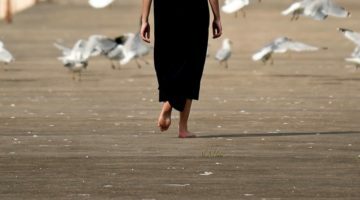 When I find myself in a waiting room, instead of giving into that ingrained habit of picking up a magazine, I now consciously practice Not-Thinking by opening my sense doors and taking in what’s happening around me. As I do this, I silently say to myself, “Let the world speak for itself.” Not only does this provide welcome relief from discursive thinking, but I’ve discovered that a world-that-speaks-for-itself is almost always a fascinating place. Discursive thinking is a deeply ingrained habit, but there’s no reason to be distressed about this. “Thinking” is what minds do! You might try noticing how thoughts tend to automatically rush in to fill any void. I remember going on vacation and saying to myself, “It will be great not to have to think about all the stresses at work.” But I soon realized that other stressful thoughts had rushed in to fill that void. These five suggestions are intended to help you consciously occupy your mind for a few minutes throughout the day with something other than discursive thinking. Resting your attention—without commentary—on what’s going on around you in the present moment is restful, calming, and restorative. Toni Bernhard is the author of the award-winning How to Be Sick: A Buddhist-Inspired Guide for the Chronically Ill and Their Caregivers and How to Wake Up: A Buddhist-Inspired Guide to Navigating Joy and Sorrow. Her newest book is called How to Live Well with Chronic Pain and Illness: A Mindful Guide. Before becoming ill, she was a law professor at the University of California—Davis. Her blog, “Turning Straw Into Gold” is hosted by Psychology Today online. Visit her website at www.tonibernhard.com. Something else I've found helpful is the advice to "not feed the thoughts." I can't remember where I read it but it's something that has helped me to prevent thoughts from sticking, per number 2. If you don't feed the fire, it can't keep burning. I love the idea of "not feeding the thoughts" and agree it goes well with the idea of keeping thoughts from sticking. We usually feed thoughts by spinning stressful stories about them (as I illustrated with the "I don't feel well" example) and then we believe those stories without question. It just enhances our suffering. Thanks so much for your comment.